is a web-based course that is set up for a predefined learning goal, and it enables thousands of learners to participate. MOOC offers new educational environments that enable for learners to make interactive learning such as discussion, quiz, Q & A between professors and learners and among learners as compared to a standard web-based course. In addition, learners will share knowledges among different learners with different backgrounds, which will lead to a new learning experience beyond the fence of the university. Based on the advanced ICT infrastructure environment and e-learning technology, Korea has already achieved the world's highest level of IT education in the world. In the future, we will do our best to become K-MOOC as a global luxury brand. it will establish a lifelong learning foundation for higher education and contribute to national human resources development. Basic learning for various qualifications, exam preparation, etc. In addition to the Ministry of Education and the National Institute for Lifelong Education, K-MOOC is working closely with related institutions such as the Korea Education and Research Information Service, the Korea University Education Council, and the Korea Education and Broadcasting Corporation (EBS). 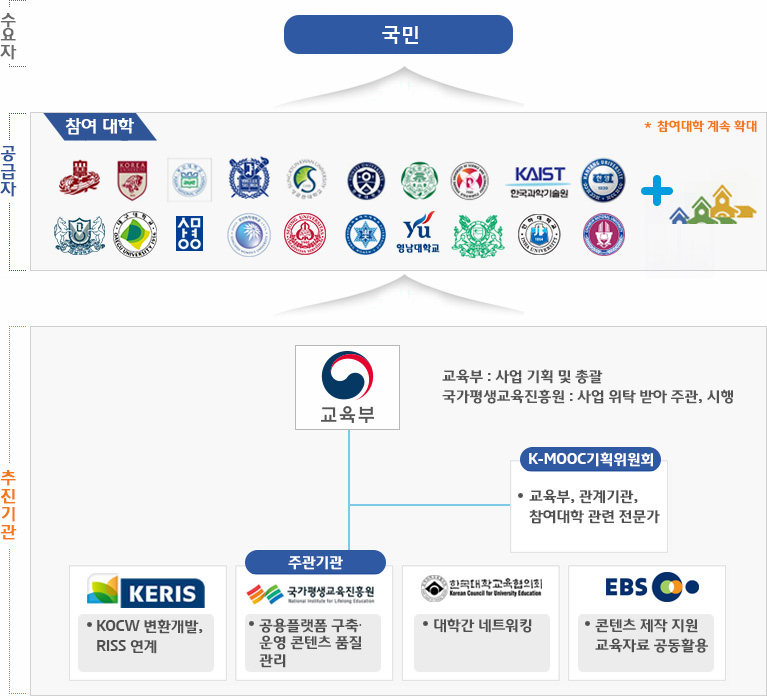 The participating universities that provide courses on the platform (http://kmooc.kr) and run courses are 20 universities including Seoul National University and KAIST in 2016, and K-MOOC plans to expand the number of lectures and participating institutions every year. We plan to promote the autonomy and diversity of the participating universities. In fact, you can just sit down and listen to the best lectures in the world for free, (syncopation) MOOC is practiced in Korea, not spreading though, so it is necessary to increase its utilization in various ways.